The dream of nearly every young karter today is to one day become a professional race car driver. Many set the bar high with Formula One as the ultimate goal, while others feel that IndyCar or NASCAR could be on their future path. No matter the direction, racing costs money, especially when talking about trying to advance up the motorsports ladder. Throughout the years, we have watched drivers make their way from karting and into the spotlight of the major professional motorsport ranks. In 2010, the Mazda Road to Indy program was established to help support young drivers graduate through the lower junior open wheel ranks (USF2000 and Pro Mazda) with the goal of helping them reach the Indy Lights program and then, of course, the IndyCar Series. Prior to the launch of this program, in the 2000s, the Stars of Karting series formed a partnership with the Skip Barber Racing School, providing a scholarship program to help elevate a top karter into the open wheel ranks each year. Among those few honorees was California native Joel Miller, who excelled as a kart racer in the shifter, TaG and ICA categories. The 27-year-old began earning victories and championships in karting at the age of 10 in southern California. Miller’s first major victory came at the 1999 SKUSA SuperNationals in the 60cc Novice cadet shifter class, and then he added another SuperNats victory eight years later in 2007 (TaG Senior). His success continued, especially in International Kart Federation competition, as a regular frontrunner at regional and Grand National events before trying his hand at open wheel racing. In 2004, Miller came back to karting full time and would later join the Tony Kart USA operation to compete in the Stars of Karting ICA division. 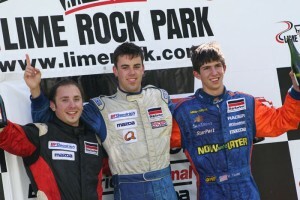 Joel finished vice-champion in 2005 to a soon-to-be Indy 500 Rookie of the Year Phil Giebler (2007 Indianapolis 500). The following year, Miller won five of the 14 races on the split national tour, contesting both East and West divisions, ending with a massive victory at the National Finals to claim the championship. Along with the title, Joel used the accompanying scholarship to move on to the Skip Barber National series. The 2007 season was another successful run for the focused Californian, going on to earn the Skip Barber National title on the strength of five victories. The competition was stout that season, as Miller beat out drivers with names such as Newgarden, Daly, Taylor, Orsolon, McAleer and Gore. He would also be named to the Team USA Scholarship program to compete in the UK that fall. With the Skip Barber championship, Mazda Motorsports provided Joel with a budget to race full-time in the Star Mazda Championship (now the Pro Mazda Championship) for 2008. Racing with JDC MotorSports, Miller claimed the vice-champion position behind John Edwards to close out the year, earning one victory in addition to six podium finishes on the 12-race schedule. He returned with the team the following year, ending up fifth in the standings. The funding was never there to put together a full season in Indy Lights after some one-off events in 2010 and 2011. An opportunity in sportscars arose in 2012, and his skill set blossomed in the tin-top cars. By 2013, Mazda asked Miller to become a factory driver with SpeedSource and aid in the development of their SKYACTIV Diesel motorsports program in GrandAm. Joel finished second in the GX driver standings that year, finished seventh in the PC standings in 2014, and seventh last year in Prototype. This year, Miller is set to driver the #70 Mazda Motorsports machine in the entire WeatherTech SportsCar Championship, which includes the Rolex 24 at Daytona this weekend. We tracked down the former national karting champion to discuss his years in karting, making the transition to cars and his perspective of what young drivers today should focus on. eKartingNews.com: How were you introduced to karting as a kid? Joel Miller: It was during the holiday season, actually. When I was six-years-old, my grandpa had just returned from a trip to Phoenix, Arizona where he bought me a PCR kart. He brought the kart to my house and the neighborhood soon heard the sound of a Junior Sportsman Yamaha racing up and down the driveway. My first days at the track were split between Adams in Riverside and in Perris, CA. My uncles Mike and Mark Burns both raced karts when they were younger and when I came of age, my grandpa wanted to start back up in karting, this time with me and my cousin Justin Burns. Ever since I was old enough to see over the dashboard while sitting on his lap, I was driving something at his ranch. Tractors, trucks, you name it. Seeing a gas and brake pedal plus steering wheel was not so foreign the first time I sat in the kart. Karting started as something fun to do, but racing soon followed. I was not allowed to race until I could hold my own on the track and each day we drove home from the track we talked about what should have been better and not about the things that went well. Whatever happened during the day, it was never good enough. Also, when we started racing at the club level, he always made me start at the back. Whether it was a pea-pick format or qualifying, I had to start every heat race and main at the back of the grid during my early years of racing. His thought was ‘this is how you learn how to pass and work your way through traffic’. Honestly, looking back at this process, it was one of the best things he could have done for me because it taught so many valuable traits. My dad took things over prior to the 1998 season and we started racing everything we could physically drive to. We would race Saturday night at Adams and then drive to Willow Springs or Perris to run the Sunday race on the same weekend. As long as I kept my grades up, we would keep racing (laughing). On the rare weekends, when there was not a race we would find a track to practice at and at the end of each day, the mandatory 20-lap session to simulate the main finished off the day. In the early days of karting, we never had any hired help. My dad would work late into the weeknights getting the karts ready for the weekend while I did homework. We learned some tricks from various people in the paddock, but our general rule was if the kart was straight and everything was kept as close to standard as possible then we could get the job done at the track. I was a ‘keep it simple, stupid’ kind of thought process. On the big weekends, such as IKF events, we would run three classes and thus would have two or three karts. Since it was only my family at the track, my dad would work on the kart and my mom would take me to the grid. My dad would show up in time to start the kart and watch the session or race. I learned the simple things about putting tires on, setting the chain tension, and generic ‘how to turn a wrench’ at an early age, which helped in understanding how things worked. We were also fortunate enough to meet some good people along the way that provided good input such as Jon Targett, who I am happy to say I am still friends with. Karting is definitely the purest form of the sport and I’m glad it was learned the way we did. EKN: What was your favorite moment during your karting years? JM: My absolute favorite moment during my karting years has to be winning the ICA North American Championship. Coming up through karting, I always looked up to the drivers who ran direct drive, namely those who ran Formula A. Also, the Tony Kart team was the manufacturer that was always the team to beat, so obviously from a young age I dreamed of driving for them. In 2006, everything came together and I was able to win the championship in ICA running for the team I always dreamed of driving for. EKN: What is your proudest achievement in karting? JM: My proudest moment would honestly be a tie between winning the ICA Championship or the IKF Nationals and getting the Duffy. This was when the Duffy still meant something as well. Those two trophies sit side-by-side at my parents’ house currently. Throughout my time spent in Jr. 1 and Juniors, we got so many second place finishes at the Nationals after leading the whole race, only to lose it on the last lap, so finally winning a Duffy has always stuck in my mind. The funny thing is, I can remember crossing the finish line for the Nationals like it was yesterday and the same feeling I experienced then was the same feeling when we won the ICA Championship, everything went quiet. That is why these two would be tie. EKN: When you reached the pinnacle of karting, what was your outlook moving forward? You attempted to move up the open wheel ranks. Was driving in IndyCar the ultimate goal? JM: I actually tried to move out of karting in 2003 but ran out of money real fast (laughing), so I went back to karting to win the only thing that would get me into cars with someone else covering the budget. At the time, it was the Skip Barber Scholarship, and nothing else mattered. My goal was always to move up the ladder with the focus being IndyCar and the Indianapolis 500. Open wheel competition, IndyCar, and the Indy 500 will always be on my mind because that is what I grew up with. However, I have found a new home and a new challenge with sports cars in endurance racing, so you can say the new goal is Le Mans and winning the championship here in the United States with Mazda in IMSA. EKN: Your path with Mazda made a shift, moving over to the sports cars with them. What was your first impression of piloting these cars compared to the open wheel machines? JM: The good thing was they still had four wheels and a steering wheel (laughing). In all seriousness, the driving side was a small adjustment because its a race car, as a driver you find its limits, and carry on as normal. The biggest adjustment was the mental side of things. Sharing the car with a co-driver was something I had to get used to because any adjustments had to fit both drivers’ preference. On the driving side, you had to learn to think big picture, when to take risk while passing other class cars, fuel conservation, and the biggest part of all was working with a big team that represents a car manufacturer. It is very easy to think on the ‘ground level’, lets say, but when switching over, I had to learn how to think on a much higher level. A level where you have to understand the knock-on effects of anything you say or do. In open wheel, when you get down to business at the race rack, it is all about making everything right for YOUto do your job. In sports cars, it is all about the CAR and the TEAM with the drivers being an integral part of the system. In open wheel, you may have time to get the car just perfect for you, but in sports cars, you have three to five laps before the race to get comfortable and that is it. In sports ca,rs you must compromise, understand that what you have is what you are going to get so make the most of it, and then figure out how to get it to the front. This, of course, could occur sometimes in open wheel but for comparison, there are times in the sports car world where a driver must remain very fluid with the situation. EKN: Is there anything you can take from driving a kart to piloting a sports car? JM: Karting is the truest form of the sport, hands down. Karting supplies the foundation, racecraft and pure driving for what it takes to move up the ladder system, well before they had those plastic bumpers that protect the rear wheels and act like a target. Those would be the direct links between sports cars and karting. In sports cars, you still have those laps when you get to push flat out so you have to be ready to maximize those opportunities. At that point, you tap into what you learn in your karting years. EKN: Your involvement with Mazda goes beyond the racetrack with their Racing Accelerates Creative Education (R.A.C.E.) program. Tell us what that involves. JM: The R.A.C.E. program focuses on increasing the STEM awareness in high schools. STEM stands for ‘Science Technology Engineering and Math’. One of our big messages reflects an interesting stat: for every engineer who retires from the industry, we require three new engineers to carry the workload, thus showing the need for new engineers. The program goes to local high schools in the areas we race and has presented to 25,000+ students so far. With my Mechanical Engineering degree, I can speak to the students and show them that the foundation they are learning in high school is important and how it can pay off later in life. We have some interactive slides that show a simple math problem from the real racing world using equations they learned in high school. Over 50 motorsport-related job positions are represented in our presentation that embody the STEM disciplines from the basic to complex. This shows that someone can get involved in motorsport using what they have learned at a variety of levels. Some people think they may not be able to do something but, with some dedication to the STEM disciplines, they could be involved in the cool environment of motorsports or at some other unique workplace. We use motorsport as the teaching tool during the presentation, maybe we will make a few new fans, but hopefully we will inspire the next generation of STEM stars. EKN: As mentioned, you have a Mechanical Engineering degree from the University of California Riverside. When did you decide toward that path? What are your plans for the future with that education, is teaching in the future after your time with the R.A.C.E. program or are you looking to continue working in motorsports after you hang up your helmet? JM: First of all, there will be no hanging up of the helmet in the immediate future. There are races, championships, and titles that need to be won! Plus, I am only 27. I have always been interested in how things were built. When I was young, I asked my mom who was responsible for designing the looks and mechanical aspects of race cars and she told me mechanical engineers. From that day on, I had my thoughts directed to that form of education. Not because I wanted to build race cars myself, but to better understand them. Having the mechanical engineering degree is something only a very select few drivers have with them. Drivers may have a business or some form of associates degree which are good in there own right but they are not a mechanical engineering degree. I use my degree to better speak with the engineers on our team, converse with them on a higher level – an engineering level, and this allows us a unique way to ultimately reach our conclusion faster. This is something of value that I have that other drivers do not. In this day and age, there are many quick drivers so you have to set yourself apart from the rest. Having the mechanical engineering degree is just one of those areas. Also, having a college education shows that you have been through the motions of figuring out problems, standing on your own two feet, and meeting deadlines. It shows teams that you can be responsible. A very long way down the road, having the ME degree will always allow me to be involved in something. I am definitely a gearhead and I love figuring out a problem, especially when all the math you do adds up to something that is functional, it is a great moment. It is very cool to use the tools that you learned, put them to practice, and make something. Who knows what the future holds, but right now my main focus is being the best I can behind the wheel of a race car, everything else will come in time. EKN: What advice would you have for drivers today who are looking to move up the racing ladder from the karting ranks? JM: This is a tough question, because there are so many areas of advice. The goal for any karter who wants to be a professional driver is to make it to the top of the sport whether it is F1, Indy Car, NASCAR, or sportscars. My first piece of advice to a karter, who is still in karting, is to spend at least one year in the Senior ranks, do not go straight to cars. Each level of karting teaches you something: the Jr. 1 (Cadet) level is where you learn the basics, Jr. 2 level (Junior) is where you learn to be fast, and the senior level is where you learn to race tactfully. Beyond that, the best advice I tell karters is to have a plan on where they want to be in motorsport. This will help you understand what it may take to get there. You may have to move to a different country for example or start aligning yourself with certain programs. It is no secret that without funding it is nearly impossible to climb any racing ladder. Lets take for example IndyCar, which I have a lot of experience on its ladder system. Looking at the Mazda Road to Indy, if a driver was to fund it themselves, they’d need to budget for one year in USF2000 ($300,000), one year in Pro Mazda ($500,000), and two years in Indy Lights ($1.2M each year). Add up those numbers and that means a driver would need to bring around $3.2 Million dollars and they are not even in Indy Car yet, which your first season may run $5 million if you are good. Remember, these numbers are generic figures and there are certain teams out there that could partially fund a driver if they believe he is good enough. Those are few and far between. Now here is another idea, show that you can win and use the Mazda Road to Indy for what it was designed to be. The scholarships that Mazda provide allows the champion to advance to the next level. This has proved to be a viable path for many current IndyCar drivers who showed they were good and used the ladder system proving it can work. Having money makes getting to the top form of the sport easier, but that does not mean those who are less fortunate cannot use talent to get there, plus some funding along the way. Another piece of advice that I tell karters, was told to me by my good friend John Targett when I drove for Energy during my Jr. 1 days. At some point, it will get tough and you are going to have to ask yourself ‘How Bad Do You Want It’. How you answer that question is very important. EKN: Joel, thank you for your time and we wish you best of luck at the Rolex 24 at Daytona and the rest of the season. JM: Always a pleasure speaking with you and everyone at EKN. If any karters are at our events, please stop by to say ‘hello’.